An example of calibrating a two-wire thermocouple transmitter with a Fluke 750 series Documenting Process Calibrator. The performance of temperature transmitters and related instruments can decline, especially in the harsh environments found in industrial settings. Calibrating these instruments maintains reliability and uptime. 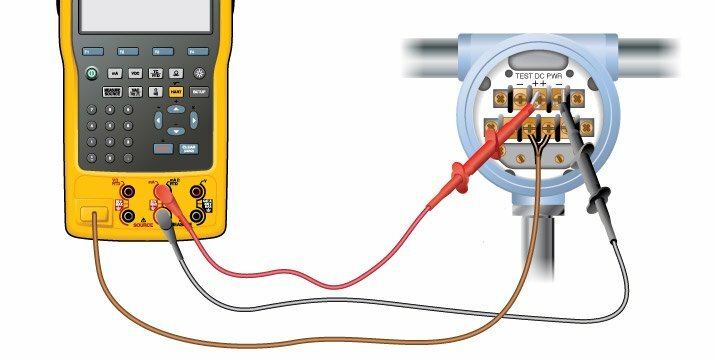 Fluke calibrators, such as the Fluke 724 Temperature Calibrator or the Fluke 754 Documenting Process Calibrator, can provide the three things necessary to accurately calibrate a temperature transmitter – sourcing temperature, providing loop power and measuring the resulting output current. Most advanced documenting process calibrators, such as the Fluke 754, can also test and calibrate both temperature and pressure instruments, which keeps the number of instruments a technician needs to carry to a minimum. The 754 can even calibrate the most-used tasks of HART electronic instrumentation, including pulsed instruments such as RTD transmitters. A calibrator combined with a dry well such as the Fluke Calibration 9142 Field Metrology Well provides a complete closed-loop solution. When comparing calibrators, the traceability of test equipment is also an important factor. Traceability means the calibration’s test and measurement functions have been verified to perform within required specification and those specifications are traceable to national and international standards. All Fluke test equipment can be ordered with a NIST-traceable calibration.